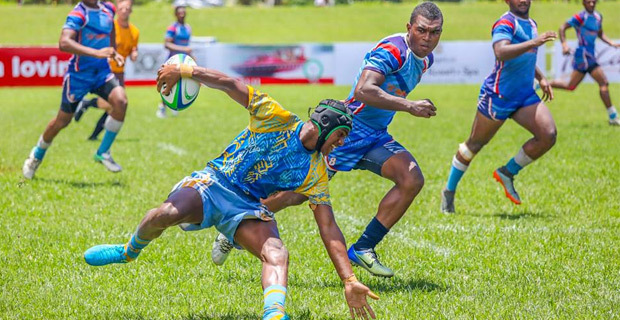 The McDonald’s Fiji Coral Coast 7s Youth competition has been filled with last minute upsets and dramatic finishes after the first round of pool matches today. NFA Youth and Ravuka Sharks drew 17-all in their second pool match. NFA was leading 17-12 at halftime and were not able to escape the pressure from the Ravuka Sharks who made a great comeback. Looking at other results after round two of pool matches, Sigatoka Young Boys team defeated the Saunivalu 12-5, KISSP Investment Wesley Fijians defeated the Rugby Academy 7s team 24-14 while Tuva Youth defeated the Nailaga Rugby team 17-5. The defending champion of the Coral Coast 7s Youth Competition is the Tuva Youth 7s team. King Select 7s managed to scoop a 12-7 win over Dominion Brothers in their first pool match while defending champion Tuva Youth made a great start with a 29-0 win over Saunivalu. KISSP Investment Wesley Fijian defeated Ravuka Sharks 10-7, Sigatoka Young Boys defeated Nailaga Rugby 10-5, Rugby Academy Fiji lost to NFA Youth 24-14 while the Gaunavou 7s team defeated Rush Academy Wolf Pach 12-10. In another dramatic finish, Ratu Filise scored a last minute try to seal a 26-17 win over NFA Youth. The Coral Coast 7s Youth Competition will finish tomorrow. The Men’s competition will be held on Friday and Saturday while the Women’s Competition will be held tomorrow and Friday. You can catch the live commentaries of the Cup quarterfinals from 11.20am, semifinals from 2.50pm and the final from 5pm Saturday on our sister station Viti FM on 92.2FM, 92.6FM and also on 92FM.